In an era when analytics and business intelligence allows just about anything to be measured, how do you determine the metrics that matter to your app’s marketing performance? Apps have the potential to drive major value for your company, with the global revenue from mobile apps stores set to reach $52 billion this year. How do you ensure you’re capitalizing on the potential that a popular, engaging app can offer? Avoid analysis paralysis by focusing on a few key performance indicators (KPIs). 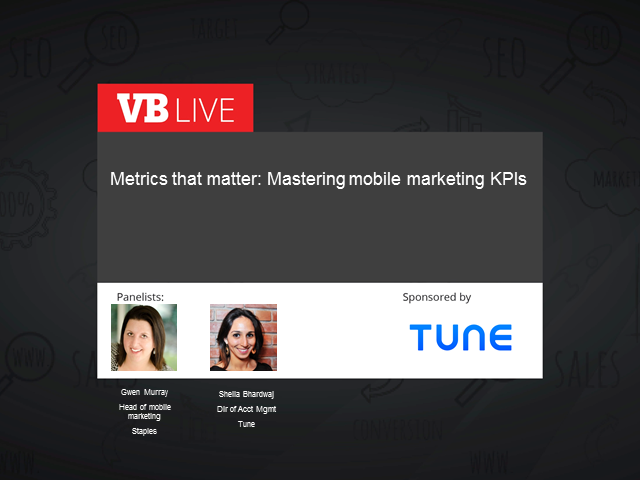 Join Gwen Murray, Mobile Marketing Lead at Staples, and Sheila Bhardwaj, Director of Account Management at TUNE, for a webinar that will teach you everything you need to know about mobile marketing KPIs, including how to decide on the right ones based on your goals, app, and business. If you’re a mobile marketer looking to understand which KPIs are available and how to use them, you won’t want to miss this. * See how your app stacks up against key industry benchmarks.